China Glaze spring 2012 TechnoPop collection arrived on my doorstep and I couldn't wait to put on Kinetic Candy, a light blue creme. I used a base of Duri Rejuvacote, 2 coats of polish and a top of Seche Vite. The formula on this polish ran a little thick so I had to be careful with wiping the brush on the top of the bottle so it wouldn't pool. Look how happy this color is! I really love spring and the sun and this color is perfect. Look how squishy this looks! It's like little cloud pillows on my nails! Even in the shade, you can see how smooth this color applies once you're careful with the formula. Finally indoors with the flash and it's just making me smile. It's smooth, it's pretty, it's blue without making me blue. YAY! More TechnoPop to come! My local Sally's still had it on the shelf! It's a blue that didn't stain and that I really do love! I agree that it is a cheery color. Looks like it would be great for stamping on and with too. Very true! I just don't think a flakie goes well with it - but I'll post more on that in a few days. Ooh good idea! I really wanted to get Glitter in the Air and have a gift card, but it's always out of stock when I go to get it! 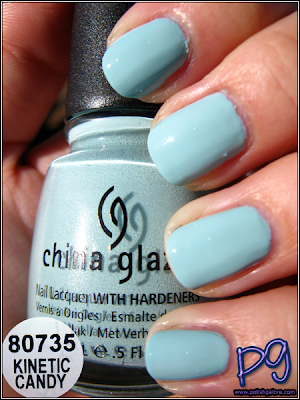 China Glaze busts out some awesome colors!